Milwaukee County’s Oak Leaf Trail is a beloved centerpiece of Southeastern Wisconsin’s world-class natural features. Those who run and ride on the 125-mile route—or simply use it to refresh their mindset—owe a debt to two Milwaukee men who had a passion for bicycling and the ability to coalesce groups of riders. Judging from the historical record, Harold “Zip” Morgan was a unique person who accomplished more than the average civic employee. Morgan had a penchant for connecting groups. Today’s trail users should be glad that Morgan made the most of this gift. He worked as the city’s director of municipal athletics for forty-two years. He was also vice president of the League of American Wheelmen and founder of the Wisconsin Council /American Youth Hostel. Morgan combined those two interests by running two-day tours with an overnight stay at the Wauwatosa Youth Hostel. In 1939, he worked with the Optimist Club and the Milwaukee County Park Commission to route riders through parkways and roads appropriate for riding around the county periphery. 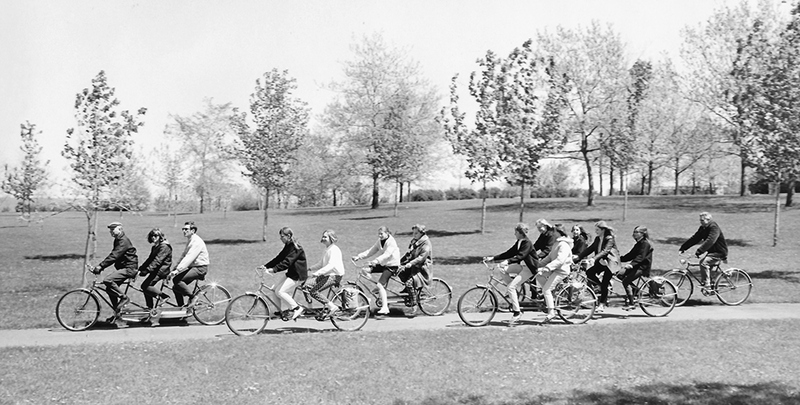 It was sometimes called the “Bicycle Tour of Milwaukee” and provided the foundation for future routes. Participants naturally passed the experience along to others, sparking a contagion effect among friends and family members. Morgan’s contribution to the local bicycling scene is commemorated in the “Zip” section of the modern Oak Leaf Trail. This section is a direct, traffic-free connection from Estabrook Park to Brown Deer Park. It utilizes converted railroad right-of-way and offers a laser-straight option. Those who crave a view of the Milwaukee River choose a more meandering, westerly route. Gerhardt (Gery) Steinke was another natural “connector” who took the next step in furthering local distance riding when he organized the first mass event, taking in the entire route as a one-day tour. Bicycling was just gaining popularity for adults and group rides were not the spring and summer ritual common to today’s weekend warriors. The yearly ride was fairly well attended. A 1973 document describes, “Over the last six years well over a thousand bicyclists from throughout the Midwest have earned their MILWAUKEE 64 shoulder patch by completing the ‘64’ in Milwaukee at least once.” The ride was legitimate enough to have a finisher’s badge and freebies like a cycling cap or water bottle, predating the swag bags with shirts and giveaways in future decades. Promotional materials make no reference to any charity benefit, which became commonplace for future rides. Organizers encouraged youth to join in as long as they were accompanied by a patient parent. Riders were encouraged to stay at the Red Barn hostel, located on the route at 6750 West Loomis Road. The 1973 route started and ended at Lake Park Pavilion in Milwaukee County’s Lake Park. The Milwaukee Journal printed the cue sheet, which riders carried in order to know where to turn. Many cyclists would have kept the cue sheet in mind and relied on the route for casual rides. Their companions would be introduced to the joy of riding through the county as city streets and parkways brought riders through several major parks. Multiple generations would experience the parks together for a memorable occasion. 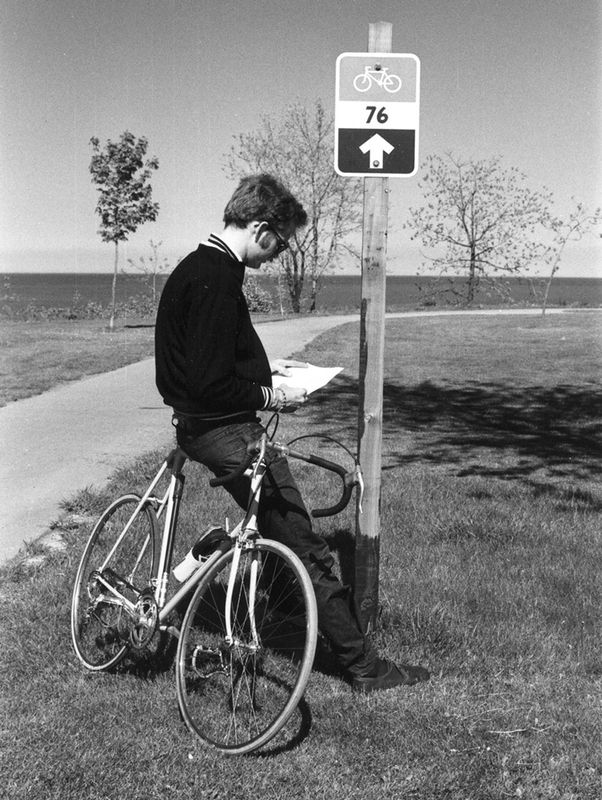 Like Morgan’s Bicycle Tour of Milwaukee, Steinke’s ride would multiply among local riders as they rode together and passed around the cue sheet. Steinke’s impact on the cycling scene didn’t end with the 64. Working with the League of Wisconsin Wheelmen, he founded a well-known route that lives on. Inspired by Iowa’s cross-state ride—called the “Register’s Annual Great Bike Ride Across Iowa,” or RAGBRAI—he created a similar ride, the “Sentinel’s Active Americans Great Bike Ride Across Wisconsin,” or SAAGBRAW. It began in 1978 and continues today. While they could never have predicted it, the routes developed by Morgan and Steinke became the groundwork for the beloved Oak Leaf Trail, which entices thousands into the outdoors. Jill Rothenbueler Maher is a local writer who toasts the trail at the website oakleaflove.com. Her 2019 book “Milwaukee County’s Oak Leaf Trail: A History” is available from The History Press at arcadiapublishing.com. Maher will present her new book at Historic Milwaukee, 235 E. Michigan St., on Friday, June 7 at 6:00 pm. 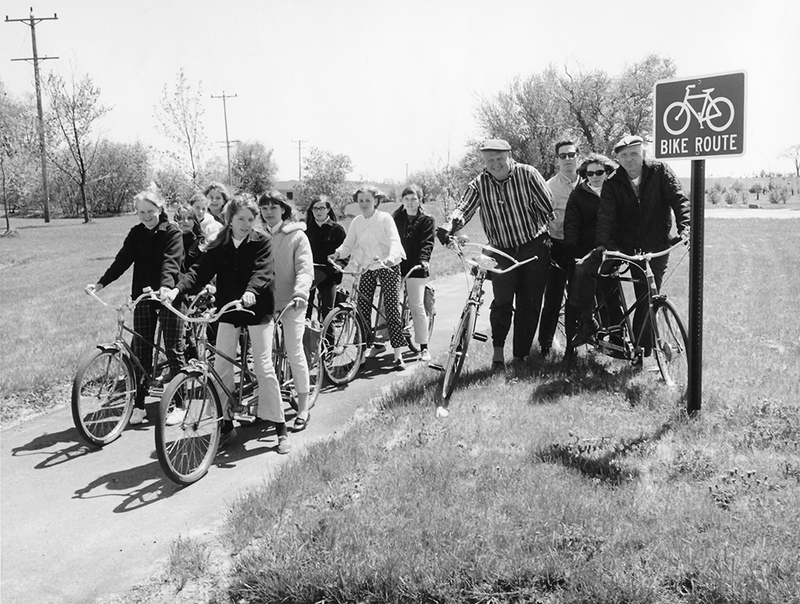 Featured photo of group on tandem bicycles is courtesy Cudahy Family Library, Cudahy WI.